Welcome Back is dumb yet entertaining, utterly silly but made with a kind of absurd, warm energy, says Raja Sen. It's hard to call Welcome Back a new Anees Bazmee film when it has its foot so firmly entrenched in all things old. A raggedy bunch of ever-cool veteran actors -- Nana Patekar, Anil Kapoor, Paresh Rawal, Dimple Kapadia and Naseeruddin Shah -- all playing dons and liars and people with unpredictable, malicious intent? Even the pop-culture references are straight from the 90s (with Nadeem-Shravan being name-checked instead of Honey Singh) and thanks to the way Patekar and Kapoor have staved off ageing, it'd be easy to mistake this film for one of many unremarkable David Dhawan farces from way back when. Which, honestly, is not an entirely bad thing. We live in an age where the loudest hits are the stupidest, when scripts of mainstream cinema rise to no greater calling than tom-tomming the name of an overpaid superstar. The hammy films of the 80s and 90s boasted at least of intricate (if formulaic) story-lines, and if there's one thing Welcome Back is not guilty of, it is a lack of plot. Give a bunch of good actors enough meat and it doesn't even matter where you point the camera, they'll conjure up something watchable. Alas, in the middle of real actors steps John Abraham. We see him first during some horrid song, festooned in viagra-themed blue confetti unable to shake up his flaccid performance. Abraham, grinning lopsidedly and trying to go 'street', looks visibly uncomfortable: think Neil Nitin Mukesh trying to do a Ranveer Singh impression. The results are predictably far from pretty. But Bazmee, bless his soul, gives Abraham very little to do and, even better, very few scenes to do it in. But then there enters the woefully talentless Shruti Haasan, clutching a fistful of rakhees and looking crestfallen, possibly trying to remember her lines, shattering hopes of a good film to smithereens soon as she appears. Haasan is a miraculously bad actress, a blank-faced ingenue mouthing lines with maddening monotony. She might occasionally look a bit like her luminous mother Sarika, but the genes have failed this child rather cruelly. The story is an absurdly silly one, but told at a thankfully brisk clip. Gangsters Uday Bhai (Patekar) and Majnu Bhai (Kapoor) have now gone straight, and are now Dubai-based hotel-magnates trying to make an earnest living. They also want to find a bride, and some tacky girl calling herself a princess captures their fancy. Meanwhile, they have just been saddled with a sister, played by Haasan, for whom they must find a suitable boy. The boy they seek out happens to be, naturally, Abraham the lout. But there are… complications. It all sounds quite unwatchable -- and some parts certainly are -- but thanks to the astoundingly fit elder statesmen in charge, Welcome Back provides its share of ludicrous laughs. 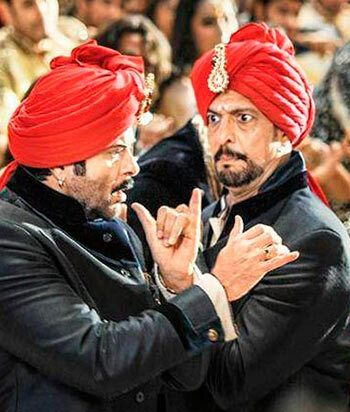 Anil Kapoor and Nana Patekar, playing paragons of brotherly love and men of thundering tempers, are superb. Kapoor wears outrageous sunglasses, a winner's scowl and is infectiously joyful when winning at a graveside game of antakshari. Patekar, daftly giggly during that same scene, is at his best when pensive or exhausted, sitting back wearily on a table when the chaos hits a crescendo. In the last film he played a don with acting aspirations; in this one, after much madness, he asks the man holding the gun what he thought of his acting. Those two are priceless enough to make this worth a watch, and the other veterans wangle themselves some random moments. Paresh Rawal, in the middle of this atrocious plot, can still come off as a sincerely outraged everyman, Naseeruddin Shah goes full-Mohra as a blind man who likes leaping over steps, and I may forever be haunted by the image of Dimple Kapadia flying through a sandstorm, eyes wild and hair akimbo. Some of the wordplay holds up surprisingly well, like a bit about how 'gun' (virtue) and 'gun' share the same spelling, and Kapoor's riffs about how he let go of his style, his 'kaayde', before he could make his gangs, his Al Qaaed-e. But those are rare moments slipped into in a film proud of its puerility. The first film had Akshay Kumar to shoulder all the buffoonery, and while even that only added up to a barely watchable film, here Abraham is an utter trainwreck and the Hassan girl doesn't help. Still, Welcome Back is dumb yet entertaining, utterly silly but made with a kind of absurd, warm energy. It's actually amusing even if it goes on far too long, and while I don't recommend going to a theatre to watch this mess, you'll sure get your money's worth watching it on TV. Plus, there's something to be said for a film where the climax features a cute peach microlight bringing about a bunch of killer drones. If only this were shorter, crisper, a bit smarter, with just a touch more… um, control, Mr Bazmee, control.